In the last week, I’ve played over 60 hours of Fallout 4. Gamers, vault dwellers, ghouls, synths, and super mutants have all been clamoring to get their hands on Bethesda’s latest post-nuclear open-world game. The door to the vault has been rolled back and we’re finally able to take our first steps into the wastelands of Boston. Get over the graphics. Sure, they aren’t the greatest we’ve seen on PS4, but the style is uniquely Fallout, and the sheer scope of the game trumps the occasional jaggy texture or goofy character animation. Fallout 4 is engrossing enough that I very quickly stopped focusing on how it looked and was captivated instead by my new life in the wasteland. My review is not about whether it looks as good as The Witcher 3 or Metal Gear Solid V. It’s about how fun and enjoyable the game is to play. You’ve seen what the graphics look like, so if for some reason those affect your enjoyment of it, knock a few points off that final score, directly proportional to how much visuals impact your satisfaction. When I say graphics, I am not talking about performance, however, and that is something that I will touch on a little bit later. Fallout 4’s story resonates with that part of me that values a family bond. Beginning before the war, you get to see life in 2077. You’ll see the bombs rip the Commonwealth of Massachusetts to shreds. You’ll witness the deception of Vault-Tec. Your infant son will be taken from you. 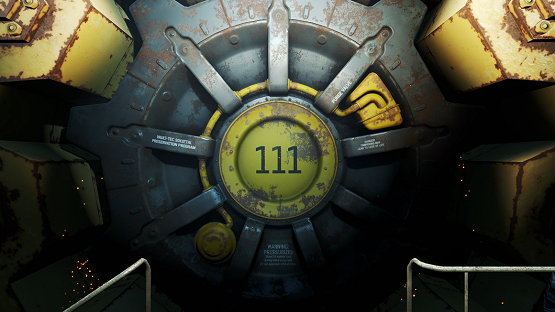 You get to leave the confines of Vault 111 more than 200 years after the bombing, a man (or woman) lost to time. It’s this incredible beginning that sets the stage for your adventures in the wasteland. This time around, your character has a voice, and while it helps to define your character far more than previous games, it also creates the terribly vague dialogue tree that Fallout 4 suffers from. In Fallout 3, the entire response was written out, so you knew exactly what you were choosing to say. Fallout 4 opts to assign the four face buttons to “yes,” “no,” “sarcastic,” and a simple question like “why me?” to nearly every conversation. It was rare that I felt any kind of pressure put on my responses. A majority of the time I would just hit triangle which amounts to the “more information” button for 90 percent of conversations held (X is “yes,” circle is “no,” and square varies between being “maybe” or “sarcastic,” which should have been called “witty” instead). These frustrations aside, the voice acting is great, and every conversation captivating, so even as I was spiraling that super mutant down a depressing black hole, I could feel the emotion as hope drained from his voice. The vague dialog tree shouldn’t be taken to indicate that there isn’t immense depth to the conversations, rather an ambiguity to what your part of it will be. Your character is driven across the Commonwealth with a purpose: to find his or her son. This back story creates a great sense of motivation as you learn more about life 210 years later. Every bit of the map is littered with stories. Skeletons, objects, recent corpses, debris — everything is placed with purpose to tell a variety of stories spanning the time since nuclear devastation wiped out life as we knew it. One particular skeleton in a small cabin is found next to a holotape indicating that she was pregnant and had just told her parents. The holotape is dated the day before the bombs fell. Other narratives are more subtle, and still more will be directly attached to missions, allowing you to dive into the lore of the area. The happenings in the Commonwealth mirror many real world issues about human rights and what it means to be sentient, leading to many very difficult decisions and the realization that you can’t make everyone happy. You’ll find yourself with many difficult moral decisions to make, and conflicts of interest as the story purposefully introduced separately to a number of factions, gets you to like each one, and then slowly turns them all on each other, all while you have your own interests of locating your son at the heart of every decision. 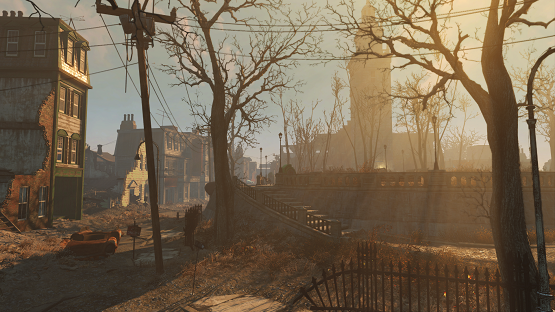 Fallout 4’s map is packed with points of interest and buildings that can be entered. It’s rare to embark on a boring walk to the next mission marker, and more often than not I was easily distracted when I would find yet another building to enter and clear. The purposeful placement of objects extends into every building, with literally every one having a story to discover. I never got the feeling that the map was too small. In fact, I rather enjoyed the close proximity of most points and ease of travel that didn’t necessitate fast traveling to every single destination. Combat has been overhauled to not rely on V.A.T.S. (Fallout’s tactical combat targeting mode) nearly as much. Shooting has been given a little bit more precision and V.A.T.S. now slows time instead of coming to a full stop, so you can’t rely on it as a fail safe. 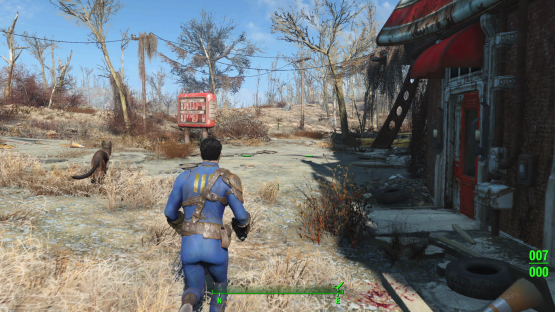 The biggest issue with Fallout 4’s combat system is the lack of item degradation. Yup, I said it. No item degradation is a bad thing. After locating and modding some decent armor and weapons, there is virtually no reason to waste previous carrying capacity on picking up any more weapons or armor. It hardly feels like “surviving in the wasteland” if that rifle with explosive rounds doesn’t need to be maintained. That stupid looking helmet that has the highest defense you can find? You’re stuck with it. Having to change up armor and weapons based on their degradation was fun and created a level of strategy to surviving that Fallout 4 simply doesn’t have. S.P.E.C.I.A.L. stats and perks allow players to heavily customize the way that they play. If you want to sneak through everything, work on agility. If you want to charm your way through every conversation, charisma is the way to go. Are you the brute force type? Better level up strength and nab those perks. I pored over the perk chart for far longer than I’d like to admit, trying to decide where to put each and every new point that I gained. If you are tenacious enough, you can level up until you gain all ranks of each of the perks, but there is still a focus on what will benefit your gameplay the most immediately. After 60 hours, I’ve barely scratched the surface of the perk chart. Instead of encouraging the pickup of weapons and armor, Fallout 4 encourages you to pick up the Commonwealth’s junk. Scraps, cans, telephones, clipboards, coffee cups — you name it, and it can probably be broken down into components to build things within various settlements. Scrap old cars, trees, and junk within the area to make room for housing, power generators, and crops. It’s your responsibility to make sure that your settlers are happy and taken care of. The customization of these areas is extremely impressive, and while I don’t have the patience to craft an entire villa with lights and decorations for my communities, the options here are sure to keep some people occupied for numerous hours. The settlement portion isn’t required though, so if you’re like me and just want to focus on completing missions and making it through the (quite massive) story, you don’t need to micromanage numerous small areas’ crops and defenses. While we all hoped it would play perfectly, it wouldn’t be a Fallout game if it didn’t launch with at least a few bugs. There are a few audio issues here and there in conversations (ones that persisted for both myself and my wife’s playthroughs). Fortunately I personally didn’t run into any that were game breaking, but I had a few close calls involving a companion and NPC AI that wouldn’t respond correctly to trigger the next part of the mission. The one thing I noticed the most was the performance slowdown the longer I played. It wasn’t pervasive at all times, but interiors, explosions, massive gunfights, and starting/stopping sprinting would all create noticeable frame skips, particularly in the latter portion of my 60 hours. Combine any of these two things, and it’s a recipe for some hefty slowdown for a few moments, usually the most crucial moments right before you die. This is paired with lengthy loading times that seemed to get longer the further in the game you are. I didn’t take out the stopwatch to time these specifically, but I definitely noticed the increase. Early on I was just reading a single tip per loading screen. I can currently get two or three tips per loading screen before it will load me into a new area. 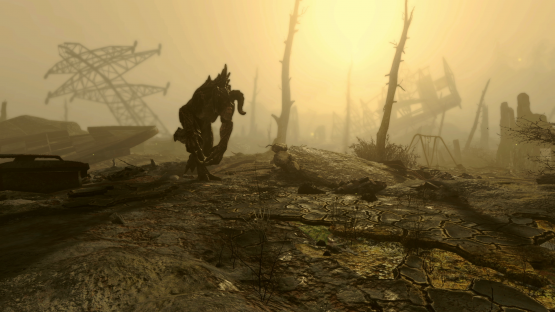 Fallout 4 has a shifted focus from prior games. In the past, the story has been about the lone wanderer surviving in the wasteland. Fallout 4 places emphasis on your character, rebuilding and what steps need to be taken to begin the construction process, focusing less on survival and more on the goal of finding your son. With this shift and the addition of the settlements and main character voices comes that simplification of things like equipment management and dialog trees. Even things like having to use stimpaks on each individual limb have gone to the wayside (even though each limb still has its own health), simplifying the gameplay. It’s a bit rough around the edges in some areas and could do with a dab of polish. Regardless of these small faults, the stories told and discovered are fascinating and the Commonwealth is immensely interesting to explore. Performance issues late in the game caused a few frustrations but not enough to dissuade me from playing further and certainly never impeding my progress. Simplifying certain gameplay elements allows for the addition and expansion of others, and while I may not care for the settlement portion of the game, Fallout 4 still has plenty to keep me interested with its countless stories from the wasteland. War. War never changes. And neither does the amount of time I’m willing to sink into a Fallout game. Fallout 4 review copy provided by publisher. For more information on scoring, please read our Review Policy here.